If you guys are anything like me, you have a “thing” for delicious mozzarella cheese. There’s nothing better than those salty little bites of chewy goodness, am I right? So, when I was asked to participate in the 2013 Galbani® Caprese Challenge, I couldn’t have been more honored or excited. Any chance to work with mozzarella, ripe red tomatoes, and fresh green herbs and you can count me in! Galbani Mozzarella Fresca™ is made in the Italian tradition of fior di latte using fresh cow’s milk. The cheese is gently stretched and kneaded, then fresh-sealed, leading to a fresh mozzarella cheese that is unparalleled in texture and flavor. The cheese is slightly firm and salty–wonderful! They also offer other delicious varieties packaged in water, as well as a marinated variety, which would be a perfect addition to any antipasto platter. The Mozzarella Fresca was recently named a favorite fresh mozzarella by the editors of Saveur Magazine, and for good reason. It melts beautifully but maintains its body–great chew factor! I also found that when melted, it released very little liquid. So often with other mozzarella cheeses I’ve tried, they released so much water–that’s no good for a pizza! Galbani Mozzarella Fresca is truly a superior product. Look for it in your local supermarket’s specialty cheese display. So, without further adieu, here is my entry for the 2013 Galbani Caprese Challenge. 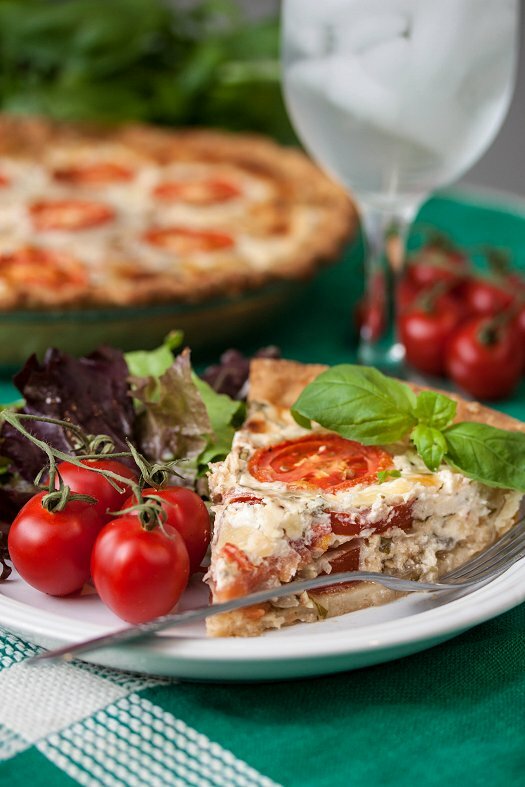 A simple pie crust filled with layers of ripe tomatoes, Mozzarella Fresca, herb sautéed onions, and a splash of balsamic vinegar then baked to bubbly perfection. Paired with a green salad, it’s the perfect light summer meal. Such a great way to put all of those gorgeous summer tomatoes and fresh herbs to use! Voting is open now, so go vote! To celebrate this fun challenge, Galbani is giving away all kinds of fun prizes to voters through August 9, with a grand prize of $500 given to a random voter at the end of the contest. You can enter once a day, so go check out the other blogger’s fun spins on the classic Italian dish Caprese, and vote for a chance to win some great prizes! Preheat oven to 350F. Place pie shell in oven and cook for 8-10 minutes or longer until lightly golden. Add olive oil to a medium skillet over medium high heat and sauté the onions until they start to brown on the edges. Add the garlic, oregano, and 1 tablespoon chopped basil. Cook for an additional minute. Remove from heat. Place the sliced tomatoes in single layer on a cooling rack placed inside a baking pan, and sprinkle both sides with kosher salt. Let sit 15 minutes to let liquids drain. Blot with paper towels. Cut the ball of cheese in half. Shred one half, and thinly slice the other half into 1/4-inch slices. Sprinkle the bottom of the pre-cooked pie shell with the herbed onion mixture. Place a layer of sliced tomatoes in an even layer on top of the onions, followed by a layer of half of the sliced mozzarella cheese. Drizzle with the balsamic vinegar. Repeat layering process. In a medium bowl, mix together the grated cheese, mayonnaise, yogurt, remainder of the fresh basil, and a sprinkling of salt and freshly ground black pepper. Spread the cheese mixture over the tomatoes. Top with a few slices of tomato for garnish. Bake at 350, uncovered, until brown and bubbly, for about 40 minutes. Let cool for at least 1 hour before slicing. Disclaimer: I have been compensated for my time to create an original recipe for the Galbani Caprese Challenge. As always, all thoughts are my own. You’ve got my vote, this caprese pie looks amazing!! Hopefully my tomato plant will start producing soon and you can bet this will be going on my menu. This looks wonderful, Laura! Best of luck in the challenge! Who knew a popular salad can be transformed into a pie?! This looks great and perfect to use those summer tomatoes in! Lovely pie! I never would’ve thought to use the caprese ingredients like this. And I too learned that the Galbani cheese log works great for pizza, not too watery at all!